Nemateleotris magnifica Fowler 1938, the Fire Goby. Some fishes and non-fish livestock don't appreciate too much current. I have been reading up on an idea but am not getting the clear-cut answer I need before I move forward. You have always been so helpful; I thought I’d throw it your way J I have a 265 gallon tank I am setting back up after a move. The pump I had before was about 650gal/hour and serviced two refugiums as well. It worked, but obviously there is lots of room for improvement here. I have an above ground pool pump/filter that was used on my salt water pool. It hasn’t been used in over a year. Its specifications are 1,200 gph (110-120V). What do you think about using this? I thought I could hook up some restrictions to control the flow and maybe connect my home-made protein skimmer. Also, I was thinking about placing some egg crate under my rock structures to distribute the weight and protect the glass. My issue here is that my inhabitants tend to move the sand causing it to show. If I placed a sheet of acrylic on top of the eggcrate, sprayed the whole thing black (I have black sand), do you see any problems from this? First of all let me say thank you for all your time and efforts. Can I use Clorox Germicidal bleach to disinfect filter socks? From what I can tell the only difference between the regular and germicidal formula is the sodium hypochlorite concentration, but it has been hard to find information. Quick question: can you effectively surface skim a standard, non-drilled aquarium by building a weir, putting the syphon intake of an external filter in this chamber, and having the water-level in the weir slightly lower than the rest of the tank? Would the water level fluctuate in this chamber only (from evaporation losses), as it does in the end chamber of a standard sump? Thanks as ever for your input. While the amount of water difference may be small, as long as the water movement is 'sealed' within an external filter, and the weir volume is large enough, I cannot see how this would be much different, to say for instance when you run a sump on its own, and feed the return of the pump back to the first section of the sump (which I have done). Effectively it is a closed circuit, but you still get the benefit of surface skimming. Is there something I'm missing here? Apologies to come back to you on this one, but I feel that this way of surface skimming has lots of potential to eliminate plumbing, drilling etc. As an aside, isn't this effectively what aquariums with hidden backs (Red Sea, Aqua Medic) do? I'm just making a guess on this one. PS - Is it a good, medium, or bad idea to share snacks of banana and apple with my reef fish? I have recently received from Tim Hayes' outfit Midland Reefs. I have a 45 gal tank with fish, LR, sand, and some Zoas/mushrooms. Not much of CUC, except for a few Nassarius and Turbos. No sump, but a canister filter with foam pads and carbon, in-tank skimmer and a powerhead. Ammonia, Nitrites and Nitrates have been all zero for the past weeks. The canister (my second one in a few months) has leaked (just like the first one, but a different brand), and I want to say goodbye to this approach for good. This, however, leaves me without mechanical filtration. The question is, should I worry about it? I've seen lots of people running reef tanks without mechanical filtration at all. Theoretically I would like to have a way to scoop all the junk from the tank, but don't trust HOB and canister filters. What would you recommend? Thank you so much for all your time and effort answering questions on this website, I have learned so much through your forums. I have a 125G FOWLR that I ultimately want to turn into a reef tank. I have about 80 pounds of live rock looking to get another 40 over the next few months. I currently have a Marineland Emperor 280 Power Filter that I am using for the physical filtration. I don't use the bio-wheel. I have read that Power Filters are generally not good for reef tanks. First question is why? I also have a SeaClone 100 skimmer. I have heard that these skimmer's are not highly rated. Mine produces about a half cup of skimmate a day. I will upgrade that to the Aqua C Remora eventually and perhaps run both skimmers. My second question is, if the Power Filters are not recommended, do you recommend another option for physical filtration? What about a HOB refugium or would the two skimmers and live rock with water changes be enough? I have been having a bit of an outbreak of hair algae, and from what I have researched some Bryopsis. I bought a Lawnmower Blenny and some scarlet hermit crabs to help combat. Ammonia, Nitrites at zero, Nitrate at ~15. Phosphate currently says it is at 0, although before the water change it was closer to .25ppm. From what I have read the phosphate could be at zero due to the algae absorbing it. Also, calcium is running between 380-400. Lighting should be fine here, just bought an Outer Orbit with Metal Halide and Actinics, display model that listed for $1300, got it for $350, one of the best bargains I have ever found. Based on this information, do you think it is ok to start with any corrals <corals> and are there any hardy ones that you would recommend? <As long as you have compatible animals in the tank, yes. As for corals, many of the soft corals are hardy and good beginner corals. Do read here and related articles. Thanks for all the replies Salty Dog. I was thinking the Hang On Aqua C Remora Pro, rated up to 120G should get me to where I need to be from a skimming standpoint. It looks like the EV 120 is an in sump skimmer, sadly I don't have a sump. Good point on the angry wife, I already stained the carpet mixing up the saltwater for a water change. <Yes, I've learned not to do anything with my tank while my wife is home. on patrol, making me nervous. Hello and thank you for taking these questions. I thought I would ask for guidance -- after 18 years in the hobby I am still looking for guidance ! Lighting; three 250 watt HQI MH & four 96 watt PC (50/50) swapped out every 6 months. 15% water change every 2 weeks. My thought is to add a Pentair inline mechanical filter or perhaps a sponge on top of the bio balls to rid some of the particulate and perhaps clean the water. Just not sure, would like some opinions before I change things up. Thanks for getting back to me. I change out the Carbon, Purigen, Chemi Clean and Rowa-phos every 2 months. 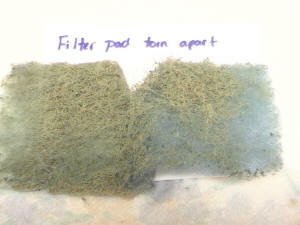 I'll try the filter pads, that should take care of the particulate. I'll need to research more on the general tank health. Re: ReefresH2O Launches Web Site, New Brand Initiative 4/4/08 Hello, <Jennifer> I had provided a press release and accompanying image to you earlier this week (per the below) to update wetwebmedia.com on the newly launched ReefresH2O web site and branding initiative, in hopes that you may consider including this in a pertinent spot on your web site. ReefresH2O is an advanced ceramic filtration product that offers many benefits to the aquatics market, as its high porosity and surface area allow for highly efficient and effective filtration of the aquatic environment. Should you have any questions or be interested in additional information on the ReefresH2O product line, please do not hesitate to contact me! Best Regards, Jennifer <Is this similar to the Cercona product line? Mmm, do contact me if I can be of assistance in developing your marketing... BobF> Jennifer Parker Parker PR, Inc.
What to do with a dirty filter?? (I have a few questions) (Sung to the tune of "What Do You Do With A Drunken Sailor") Hey there oh helpful ones! <Ahoy Angela> We have a 29 gal reef fish tank with mainly inverts - here's the list - Lights are 2 55w PCs -50lbs of live rock, 4-6" DSB -Pair of cleaner shrimp (that won't stop producing eggs). Is it common for the male to carry eggs as well? <Please read here: http://www.wetwebmedia.com/shrimpreprofaqs.htm> Both of ours carry the eggs and release the larvae regularly. -Tiger pistol shrimp/yellow watchman goby/firefish goby- These three all share the pistol shrimp's burrow and seem to get along. It's funny to watch the big firefish squeeze into the burrow. I didn't think they'd all get along in that situation. -50 or so zebra and blue hermits and one little red hermit...I have tons of empty shells for them in the back of the tank so we don't have too many wars. -Various(30+ I lost count) Astraea, Nerite, Cerith snails and 3 bumble bee snails. -2 flame scallops (don't buy these folks, you'll spend all your time feeding them!!) -3 peppermint shrimp -Scooter blenny - he was my first fish in there and feeds well on various frozen foods. He loves to hunt for pods as well. -Neon Dottyback (for amusement purposes) -Pair of true perc clowns and their anemone (An "African anemone" can't find info on them) -4 Feather dusters, an x-mas tree worm rock, plate coral, trumpet coral, green sea mat, and several reddish sponges that came on the LR that have been doing great. We also have a rock designated for those little purple and green anemones that split all the time that a lot of people consider nuisance (came with the LR). They'll eventually travel I know. <Sounds like a very healthy, full system> OK now to my real question...I have an Emperor 400 filtering all of this and have never had a problem with this tank (knock on wood) even though it has quite a few animals in it. I do small (5-10%)water changes 3 times a week, but I have never rinsed out the filters. This tank is going on 5 months old, still new. We pulled out one of the filters tonight and there were literally hundreds of those Gammarus (sp?) shrimp and other pod like creatures all throughout it. The filters look great so I figure they're keeping it cleaned...and I don't want to kill them. So do we need to change these filters eventually or will we be ok with all those creatures working on it? Thanks for all the help! ~Angela <I would be very careful re changing the filter, or cleaning it... If there is room, consider placing a filter pad (can buy material, cut to fit) on top of the existing "old" "dirty" one... and just periodically removing the new one to rinse, and/or replace. The old one can likely best serve as a sort of biological filter bed. Bob Fenner> Overflow material I have an older acrylic tank which has a internal, rectangular overflow box with notches at the top for the water to trickle over. 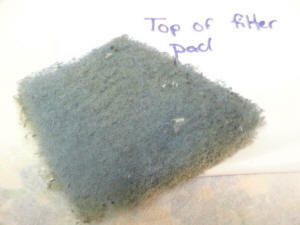 Inside the box is a fleece filter pad acting as a pre-filter. The pad holds it's shape ( A kind of 'U' shape looking from the top ) by being placed over a sheet of plastic material that I can best describe as a 1/3 " thick sheet of snarled plastic threads. 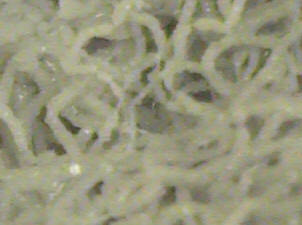 <Sounds like "Bio-bale"... product/s from CPR (Creative Plastics Research). Contact them: http://www.cprusa.com/index2.html Bob Fenner> I am having a lot of trouble finding this material and the sheet I have is getting pretty worn. Do you know what this material is called, where it might be obtained, or an acceptable substitute to use ? Thanks. - Cleaning Filter Socks - Hello Crew, question for you about a filter sock. <Ok.> I have a 30 Gallon sump which houses my protein skimmer. I was having a problem with microbubbles, some from the skimmer and some from the water flowing over the first baffle/divider (goes from the bottom of sump up about 8 inches )where the water enters the skimmer, first chamber. So I decided to empty the sump, drill three 1.5" holes on bottom of this baffle so that water would flow under and not produce any bubbles when it comes crashing down over it. Well low and behold, the water that enters the sump comes in through three 1.5" pipes and the force it enters with creates bubbles that shoot downward to the bottom of the sump. Now with the holes drilled in the baffle, the microbubbles just flow right through, CURSES!!! So I decided to use a filter sock to catch the water coming in. Problem solved. I need to add some sort of filter/sponge material to the end of the skimmer output and I will be bubble free. The question, finally: Can I just wash the filter sock out with a hose or do I need to get a new one every time. <I would keep two around - one in the sump and one out being cleaned. Best way to do this is to rinse off the big chunks and then let the item soak in a weak bleach solution for an hour or so and then rinse well and let soak in RO/DI water over-night, then sun-dry until needed.> How often should I clean it? <I'd shoot for every week, and not wait more than two weeks.> Once I do clean it, say with a hose since it has a lot of pressure/force, can I just squeeze out the water and give it a squirt of Amquel to remove the chlorine ( from hose water used to clean it). Any better suggestions? <You got 'em.> Thank you for this and all the help from the many questions I have asked in the past. Mechanical Filtration Hello: <Hi!> Thank you for the wonderful site you have put together. My question is as follows: I have set up a small (20 gallon) saltwater tank for my son. I have about 22 pounds of live rock in it, a Brown Star Polyp coral, a flame angel, two clowns and a sally lightfoot crab. I was recently advised that, with the live rock, I should remove the Penguin 170 filter and hook up a protein skimmer. I have done that, and have hooked up a Bak Pak 2R on the back of the tank. <Good moves> I am concerned, however, about not having any mechanical filtration to remove the detritus. Are my concerns valid? <No. The tank will take care of itself. When you do your weekly water changes gently siphon out any obvious detritus resting on the bottom of the tank> Also, although I was only able to observe the skimmer for about 30 minutes last night, there are many bubbles being injected into the tank. Is that just normal at startup? <Maybe. I would contact CPR and ask for their suggestions on this matter. I'm sure they will have a solution> Thank you for your response. <My pleasure! David Dowless> Scott.